June, 12, 2013, Miami, FL- A forceful rear-end collision that early Sunday morning that sounded like an “explosion” left two men dead and a North Miami DJ in critical condition. The police report states that a Toyota Corolla traveling east was slowing for a traffic light at Southwest Eighth Street and Douglas Road at 1:20 a.m. when it was rear-ended by another vehicle, a Toyota Camry, driven by local DJ Ervens Prudent, 26. The Corolla occupants who have been identified as Maria Martinez, 44, and Marlon Guiterez, 34, both residents of Sweetwater were killed, the Miami Herald reported. 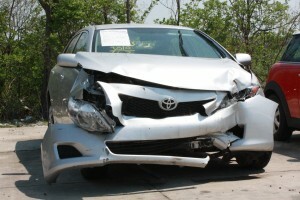 Photographs of the wreckage show that the rear end of the Camry was completely demolished. “The impact was so severe it basically crushed this Toyota Corolla. And when several police officers who happened to be a block away having coffee heard the crash, they ran over and there was no movement in the people in the Corolla,” Miami Fire Rescue spokesman Lt. Ignatius Carroll told CBS Miami. Prudent was seriously injured and was taken to Ryder Trauma Center. Police are unclear why Prudent, who DJs under the moniker DJ A.O.L., failed to stopped. Authorities have not yet determined if he was speeding or was intoxicated at the time of the accident. Red-light and intersections present numerous dangers to motorists, rear-end collisions are, naturally, common at intersections. Too many drivers are distracted; they take their eyes off the road, or are too mentally preoccupied to notice that traffic in front of them has halted. We’ve all been there; we have all had a car slow or suddenly stop in front of us. Red-lights also present the danger of T-bone accidents, these are among the most deadly accidents that a motorist can be involved in and can be very deadly. T-bone accidents are typically caused by drivers who fail to yield or stop for a traffic signal. A majority of rear-end accidents are not as serious as this one in Miami, but even without such a violent impact, a victim can be seriously harmed. The most common injury in rear-end accidents is trauma to the neck, but if the impact is strong enough accident victims can also sustain injuries to their head, torso, and legs caused by slamming into windshield, steering wheel, or deployment of front airbags. No injury is insignificant, before accident victims decide to accept a settlement from a driver’s insurer or their own; they should consult with a Miami accident attorney. You may be entitled to a higher settlement than an insurance company is willing to offer. Miami injury attorney Jonah Wolfson will be honest and upfront with you; he will tell you what your injury is worth and whether it is in your best interest to accept a settlement or file a civil suit.